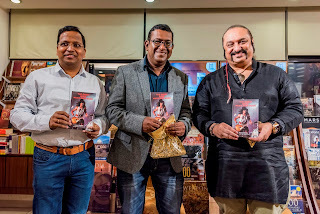 What better way to celebrate the launch of a Music Quiz Book, than to get people together through the power of Music and this precisely what happened at the much awaited book launch of Verus Ferreira’s 2nd book entitled ‘The Great Rock Music Quiz Book’ on Saturday 2nd December 2017 at Title Waves in Bandra. Today book launches are becoming more innovative and creative to add to the titles of various books being launched. Verus Ferreira knows how to make this event a unique one to remember for all his fans who gathered together to wish him all the success for this book and surely they were not disappointed. The evening began with some classic rock songs taken by artists featured in the book. You had popular singer from Bandra Lawrie D’souza singing his heart out with his opening piece Hotel California, followed by Verus’ favorite song Roadhouse Blues. The audience was left asking for an encore and he delightfully obliged with Eric Clapton’s Wonderful Tonight. The ever bubbling and enthusiastic grooming and speech consultant Sarita Manchanda was in Conversation with Verus Ferreira with a lively Q&A session. Verus shared his insights on his journey in shaping the book to its final product. He also shared his experiences of meeting a few bands, one of them being Iron Maiden whom he met in 2008 when they performed in Mumbai city. More music was coming from 20 year old budding musician and the author’s friend Klien Pereira from St .Andrew’s College who sang Aerosmith’s I Don’t’ Want to Miss A Thing and for Bon Jovi fans the song Always. No introduction was really required to announce the grand entry of India’s Colonial Cousins stalwart singer-composer Lesle Lewis. Lewis has given his stamp of approval for the book by writing a beautiful Foreword. Lesle was delighted to unveil Verus’ second book ‘The Great Rock Music Quiz Book’ and was all praise for the Author. Lesle has known the Author for many years going back to the days when Lesle released his album Colonial Cousins. “It was in 1997 that I first met Lesle for an interview for a magazine. In my wildest dreams I never imagined that 20 years later Lesle Lewis would be launching my book on music. I am honored to have him here and to be present to launch this book for me” stated an elated Ferreira. Lesle replied saying that it was a pleasure to be present at the launch and said that the book had something for a rock music lover, admitting that he was a staunch follower of rock music his favorite being Jimi Hendrix. 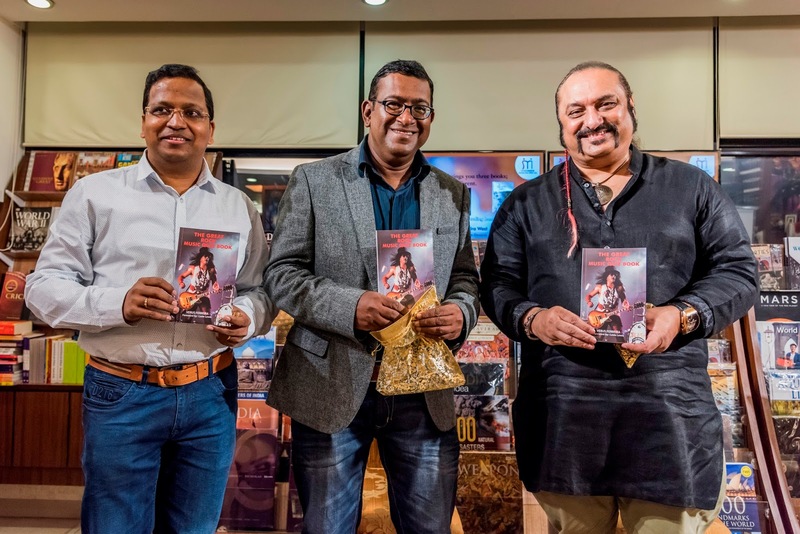 Verus also thanked Co Founder of Story Mirror Mr. Bibhu Datta Rout for having published the book on Music and making Verus, the first music book writer in the publisher’s vast catalogue. Says Ferreira “This book that has over 950 Questions and Answers, is sure to bring back memories of house parties, the days when we used to play air guitar to rock anthems like Hotel California, Brick in the wall, Wonderful Tonight, Sultans of Swing, We Will Rock You and Roadhouse Blues, among many others. The book is also a source of education for the younger mobile phone generation who missed out a way of life that might never return”. The evening continued with Lesle Lewis taking center stage to belt out his favorite tracks from his early Colonial Cousins days singing one of the hit songs Sa ni dha pa. 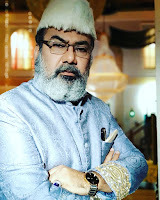 He also gave the select audience, a peek of his new songs which is available online with one of them being Paise Ki Maa Ki Aankh and many more. Lastly the evening featured a live performance by Gospel singer Macklin Lacerda from the Gospel rock band ‘Open Secret’ who is also featured in the book. Macklin spoke a little on Gospel music when he said that the Gospel music has the same rock sound, with only its lyrics making the whole feeling seem different. He then gave us a scintillating performance with two examples, Coldplay’s Fix You and U2’s I still have not found what I am looking for. The evening ended with a rapid fire rock music quiz with questions taken from the book. Many from the audience, who got it right, were rewarded with a prize. Go check out ‘The Great Rock Music Quiz’ and test your knowledge on bands like Aerosmith, Scorpions, Iron Maiden, Guns N Roses, The Eagles, The Rolling Stones, and many more. A good read for all rock music fans. Available on Amazon, Flipkart and book stores across the country.